Article 43.2 of F1's sporting regulations states: "Should for any reason the end-of-race signal be given before the leading car completes the scheduled number of laps, or the prescribed time has been completed, the race will be deemed to have finished when the leading car last crossed the line before the signal was given." 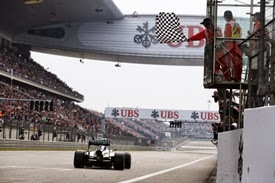 That means that the Chinese GP was declared to have finished on lap 54 of the 56 that actually ran. "I looked up, I was coming across the line expecting to do another lap and all of a sudden I looked for a split second and I saw the flag. "I lifted for a second and I saw there was no one on the wall, so then I just kept going. "I did lose a second or so. I asked the team, they said no, so I just kept going. "Very, very strange. It was good to do another lap." The changed distance did not alter any of the points-scoring positions but it did result in Caterham's Kamui Kobayashi being relegated to 18th, having pulled off a late move on Jules Bianchi's Marussia for 17th.